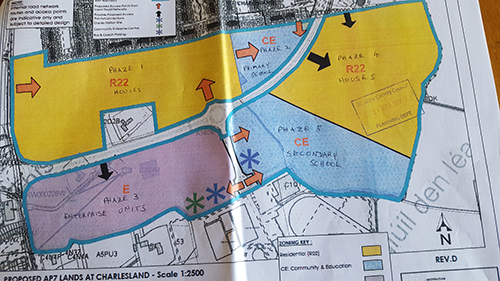 Cairn Homes applied for permission for 192 homes in Charlesland but originally did not commit to building the required Enterprise Units. I objected to this as jobs cannot be created in Greystones unless work units are built. Only 16% of Greystones people work locally compared to 29% in Bray. Probably the greatest dependency on commuting of any town in Leinster and is unsustainable. Jobs are urgently required as we can’t all commute on the overcrowded N11 or DART. Yet all developers want is to build houses. I am glad that Cairn have now changed and committed to 8,000 sq.m. of Enterprise Units in Phaze 3 before the final 200 houses are built in Phaze 4. This is to include 2,700 sq.m. of Community Units for start-ups. A decade ago I wrote a paper with the Chamber of Commerce showing the need for this and this was included in the site plan which is why it has been committed now. A Primary School is to be built in Phaze 2 and a Secondary School, next to the sports facilities, in Phaze 5. A bus interchange is to be included in Phase 1 as required, this is needed if we are to have a good bus service. Cairn are currently selling houses on an adjacent site.